This invention relates to a composition for personal care products such as cosmetics comprising alkoxylated fatty alcohol and polysiloxane, useful mainly as a base for the manufacture of creams and lotions. The composition may also be used as, or as a part of, a carrier for physiologically active materials including pharmaceuticals. The principal purpose of the composition is to enhance the spreadability on the skin of the final product, but it may serve subsidiary purposes as a carrier or emulsifier. Frequently, it will be incorporated into oil/water or water/oil emulsions. Alkoxylated fatty alcohols are a useful component of topical compositions in that they provide an emollient effect. By "emollient" we mean promotion of retention of water. They have certain disadvantages in that they may be of high viscosity and may have a spreadability less than in certain formulations. It is known that spreadability depends upon the surface tension of the material in the air (see R. Keymer: "Zur Spreitung flussiger Lipoide auf der Haut", Pharm. Ind. 32(7), 577-581 (1970). We have found an additive for alkoxylated fatty alcohols which reduces surface tension and hence increase spreadability. Viscosity is also reduced. The compositions also have advantageous low temperature storage properties. The additive concerned is a cyclic siloxane in the form of tetramer or pentamer. where n is 4 or 5 are also usefully volatile, having boiling points of 175 deg. C and 210 deg. C respectively. It is known from European Patent 35899 that such silicones may be included in hair conditioners, in which the active ingredient is a quaternary ammonium compound. 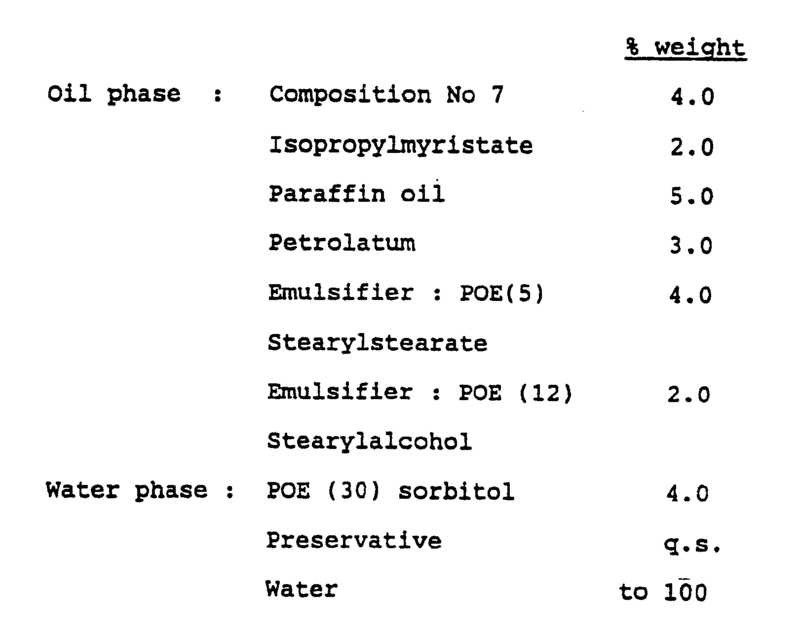 Emollients are not mentioned though isopropyl myristate is mentioned as an oil additive. UK patent i 467 676 decribes antiperspirants in which volatile silicones replace isopropyl myristate which is described as an emollient. In US patent 4268499 antiperspirant compositions are described which include cyclic silicone and non-ionic surfactants based on fatty alcohol ethers and polyoxyethylene derivatives. No surfactants containing polyoxypropylene groups are mentioned. US patent 4246257 describes a cosmetic cream which may include silicone, waxes, emulsifiers and oils, but no truly emollient material. US Patent 4511554 discloses and claims an antiperspirant stick which contains, as essential components, a mixture of polyoxyethylene (25) propylene glycol stearate of a defined formula and a polyoxypropylene, polyoxyethylene ether of a long chain fatty alcohol, the formula of this also being specified. The antiperspirant stick of US Patent 4511554 may contain further components but all compositions contain the noted essential components, both of which contain oxyethylene units. US Patent 4364837 discloses a shampoo which comprises a water-miscible saccharide, water, a nonionic or cationic hair grooming agent and an anionic detergent. The nonionic hair grooming agent may be silicones including cyclic silicones. The shampoo may also contain a nonionic detergent which may be an alkylene oxide condensate, the specific compounds noted being ethylene oxide condensates. 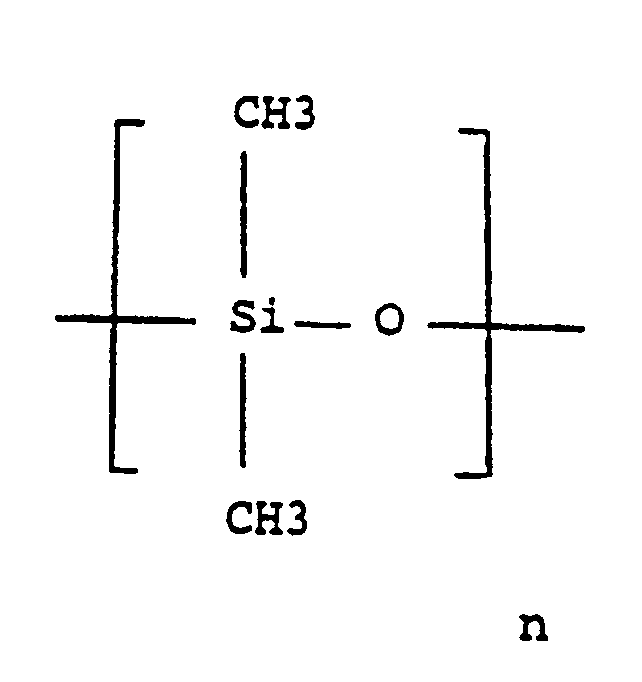 In "Seifen-Ole-Fette-Wachse", Vol 108(1982) No 14, 14 September 1982, page 428 there is disclosed a formulation under the heading "Moderne Silicongele" which contains Procetyl AWS and Volatile Silicone 7207 (Cyclomethicone/Witco Corp). Procetyl AWS is an alkoxylated derivative of cetyl alcohol which contains oxypropylene (5) and oxyethylene (20) units. Cyclomethicone is a cyclic dimethylpolysiloxane. Other components are present in the composition but the only alkoxylated component (Procetyl AWS) is one which contains oxyethylene units. The compositions of the present invention achieve more than a simple viscosity reduction effect. Oil and water creams and lotions are applied to the skin top to give a moisturising effect. (B) 95 to 5% by weight of tetra (dimethyl cyclosiloxane) or penta (dimethyl cyclosiloxane) or mixtures thereof. Preferably the composition comprises components A and B in a weight ratio of 20: 80 to 80: 20. The group R is preferably a C₁₀-C₂₀ hydrocarbyl group, more preferably, for reasons of availability C₁₂-C₁₈ group. It may be linear or branched, saturated or unsaturated, and may be substituted with a hydroxyl substituent group. In the last mentioned case, the hydroxyl group may be alkoxylated. The value of m is preferably 10-20. The following compounds are examples of those which may be used as component A of the composition of the invention. Where POP = Polyoxypropylene and the number in brackets represents the number of moles of propylenoxy units included. Polymer units derived from ethylene oxide are not present in component A.
Compositions according to the invention are made simply by mixing the two components. Further components may be added, perfumes, dyes, waxes and so on, depending upon the application. Similarly, the composition of the invention may be incorporated into a wide range of personal care and pharmaceutical products, normally for topical application, more particularly skin application. A useful range of applications for the compositions is to be found in oil in water and water in oil emulsions. In water in oil emulsions, the composition of the invention, using tetramer siloxane, gives cooling effects on the skin with a lower greasiness sensation. The emollient effect of component A aids water retention and enhances skin elasticity. The admixture of component A reduces the freezing point of tetramer siloxane, thereby aiding storage properties. These is no astringent effect associated with the cooling effect, making the compositions suitable for inclusion in sunburn and suntan treatments. In oil in water lotions and creams use of the composition of the invention enhances the spreadability of the product without leaving a sticky feeling on the skin. Compositions according to the present invention may be included in a complete cosmetics formulation to the extent of typically of 2 to 30% by weight of the total weight of ingredients, preferably 2 to 10% by weight. An oil/water/emulsifier system will form the main part of the rest of the compostion, the emulisifier being typically 3 to 10% by weight of the total. Moisture regulators, thickeners active ingredients, preservatives, perfume oil, colours and pigments may be added in usual amounts. The invention is illustrated by the following examples. Parts and percentages are given by weight. 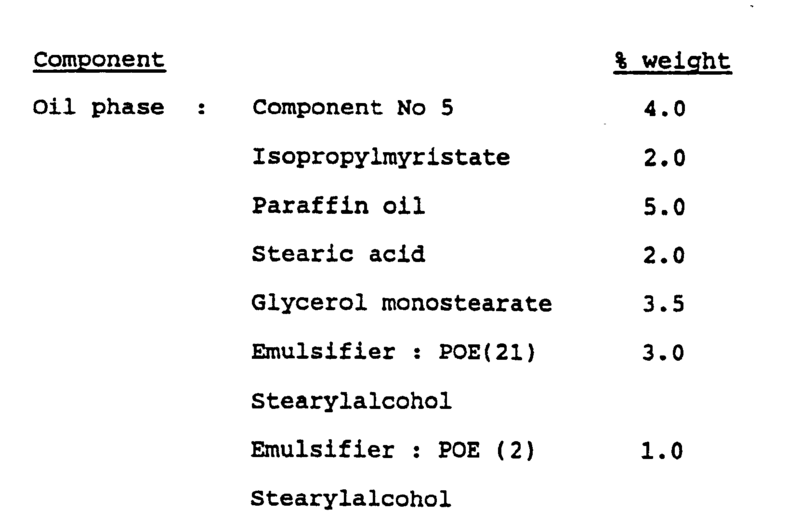 POP (15) stearyl alcohol (A) and tetra (dimethyl cyclosiloxane) (B) were mixed together in various proportions and the melting point of the mixture was determined. For certain compositions, surface tension was measured. 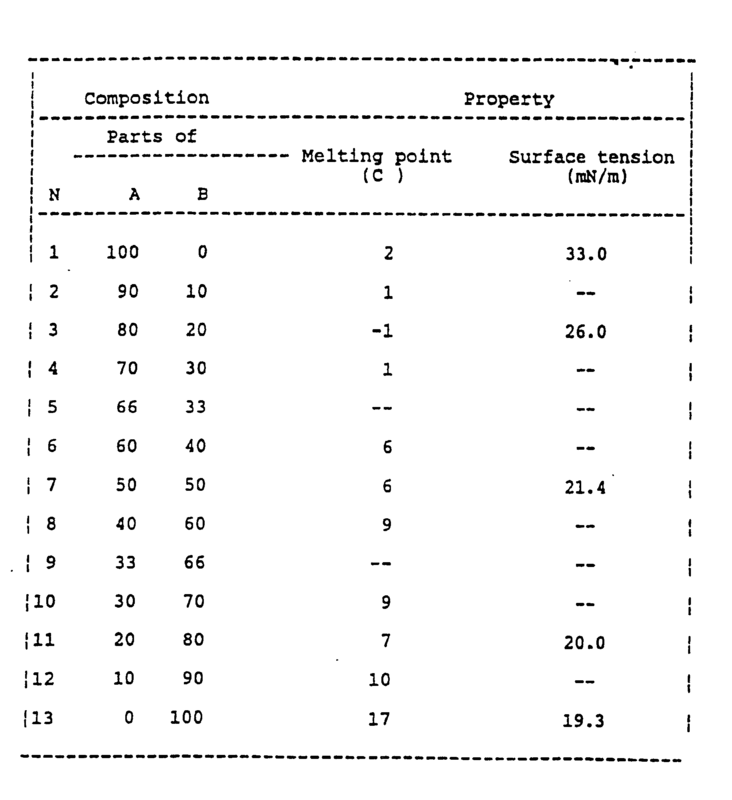 Pure components and their properties are included in the table below for comparative purposes. It will be seen that the disadvantageously high melting point and surface tension of the siloxane is reduced by quite small amounts of added stearyl alcohol ether, and further additions give less marked changes. 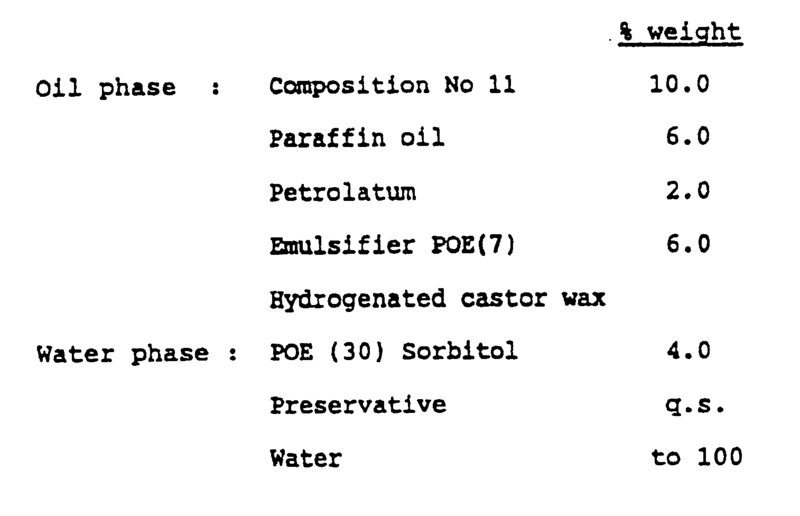 A water in oil lotion was prepared as follows, using a composition from example 1. 2. Heat the water phase to 40-60 deg. C, mix and add slowly to the oil; phase using a high shear mixer. 3. Continue mixing for 30 minutes whilst cooling to room temperature. The product lotion is moisterising, water resistant and gives a tack-free skin feel. It has a refreshing cooling effect on application with a dry lubrication after feel. As active ingredients, sunscreen agents, allantoin, collagen and vitamins could be incorporated without loss of emulsion properties. 3. Continue mixing for 30 minutes whilst coaling to room temperature. The cream was moisturising, water resistant and tack-free after use, giving a dry lubricating effect. Active ingredients described in Example 1 could also be incorporated. 3. After forming the emulsion continue mixing at reduced speed with cooling to room temperature. The soft oil-in-water lotion produced showed lamellar liquid crystal phases, with water retaining ability and a good moisturing effect. The product is a non-greasy, quick penetrating moisturising skin cream. Lamellar liquid crystal phases are present. (B) 95 to 5% by weight of tetra(dimethylcyclosiloxane) or penta(dimethylcyclosiloxane) or mixtures thereof. 2. A composition as claimed in claim 1 in which the weight ratio of A to B is from 20: 80 to 80: 20. 3. A composition as claimed in either claim 1 or claim 2 in which R is C₁₂ to C₁₈, and m is 10 to 20. 4. A composition as claimed in any one of claims 1 to 3 in which R is octyl, cetyl, stearyl, hydroxy stearyl, erucyl or oleyl. 5. A method of making the composition of any one of claims 1 to 4 wherein components A and B are added together and mixed. 6. Oil in water or water in oil emulsions containing from 2 to 30% by weight of the composition of any one of claims 1 to 4. 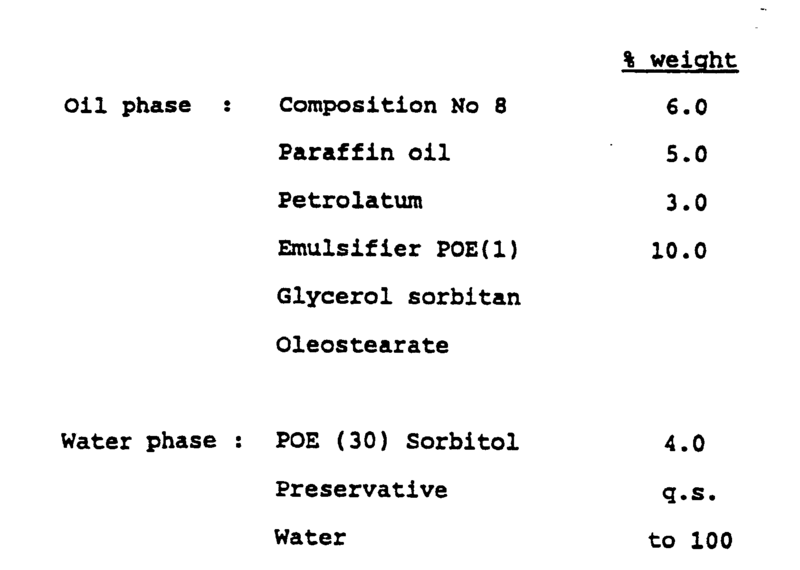 AT86305522T AT62402T (en) 1985-08-01 1986-07-17 Koerperpflegezusammensetzung, an alkoxylated fatty alcohol and a polysiloxane containing. Owner name: DEUTSCHE ICI G.M.B.H.